I seemed to have had a dining week and my waistline on my skirt felt it yesterday. Friends invited me to dine at Harbour Village for Thanksgiving. La Balandra is certainly one of the nicest dining spots but food has been mediocre at best and recently, it was closed to the public. Now with a new F&B manager and some public hours it will be interesting to see what transpires. We had the Thanksgiving menu. Staff were very attentive in fact over the top. My friends reside at HV so perhaps that was the reason for the incredible reception. We all ordered the turkey menu. Our menu started with a nice salad with candied walnuts and cranberries. The turkey was a small but decent portion of dark and white meat with a nice gravy. There was mashed yucca which was very stick to your ribs but tasty. There was a formed stuffing which was another stick to your rib dish and again tasty and finally grilled frozen corn we could not eat. It was too sticky/gummy and was sticking to our teeth. We had a good laugh. The setting is magical, on the water with the breezes steady keeping the night comfy and bug free. It was a lovely night. The food was really good but knowing the prices in the past, I doubt I could afford to dine on my own. I would certainly consider it for lunch with out of towners sometime. The staff are South American, Mexican and Antillean. I enjoyed their service well. My amazing friends from Milan invited me for apero’s and then dinner. What fun!! We had no reservations so could not get into their first choice, Rains Fishes. We ended up on a street table at La Guernica. I have eaten here once but do not love it because one dines on the street where the American Graffitti like traffic procession of young locals goes by….I must have waved at 30 people during my dinner. I prefer a more private experience. First of all, the young Dutch servers were pleasant and very efficient. We all ordered the fresh fish, Erika and I had barraccuda in lime sauce (on the side) and Claudio had the Mahi Mahi. The price was 39, 00 naf/21.00 USD for dinner with just water as we had drinks before. If you like tapas or fish dine here but ask for a table on the back. The next night I treated the Italians and my friend Matt to dinner at Mi Banana, a Columbian owned hole in the wall across from our famous brothel Pashi’s Place. With Pashi’s pretty pink and red lights it was a fun and giddy experience for the newcomers. The restaurant is lively with bright lights. The bar crowd is busy but not over the top noisey. I always dine here and rely on great service and fresh fish. We all had the red snapper filet in garlic sauce with rice and veggies. I had so much I brought the leftovers to the cats. We had aperos first at the Italians so food only, fresh bread and water for 56 USD for 4. What a steal. Wed. night I had girls night with two friends who reside on island and our other friend, a flight attendant for KLM. We wanted Roti so dined at Cocos on the waterfront. The place is VERY casual and simple. The fare is Surinamese. Our server a lively fun local guy kept us laughing. The Roti came quickly. 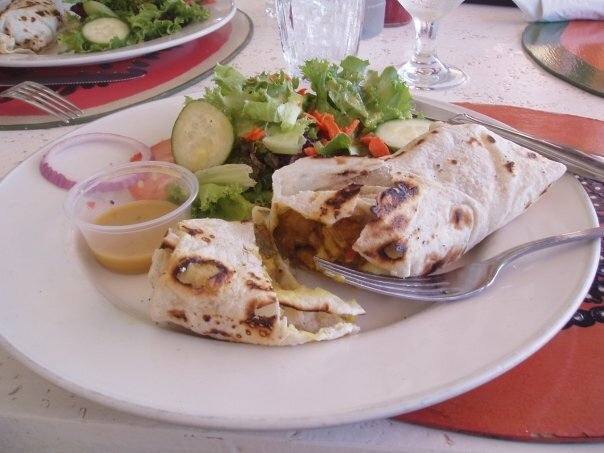 It was typical Surinamese style with the curry on the side and the Roti folded neatly, to be used as a means to fill or push the food into your mouth. We also had lovely Surinamese style green beans and pickles. It was 20,00 naf for the Roti or 11.00 USD. I had fruit punch but forgot the price. I am on the food wagon today…in 16 days, more friends come and naturally more eating and drinking..